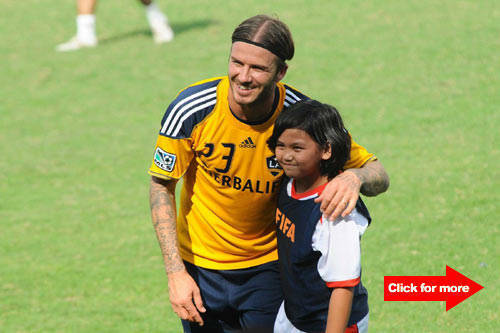 Follow the football ace and see how he rocked his Philippine visit. 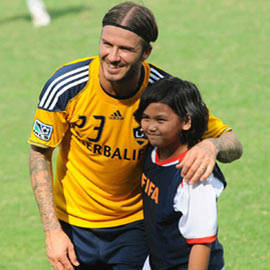 Beckham with a participant of a football clinic. Click for more. (SPOT.ph) International football star David Beckham, together with his team, the Los Angeles Galaxy, played against the Philippine Azkals, in what could possibly be a once-in-a-lifetime game on December 3 at the Rizal Memorial Stadium. The Galaxy bested the national team 6-1, which included a heart-stopping curling goal from Beckham himself. "Last year, I wouldn't even think that we'd be playing Beckham today," said a star-struck Phil Younghusband in a GMA News Online report. Younghusband, who scored the team's lone point added, "To score in the same game as David Beckham, to score in the same game as my hero was special." Watching the formerly improbable game from the sidelines were a horde of celebrities that including world boxing champion Manny Pacquiao and his wife, Jinkee; Younghusband's rumored girlfriend Angel Locsin; Mylene Dizon, Dawn Zulueta, Maxene Magalona, Cristalle Henares, as well as politicians like Manila Rep. Amado Bagatsing and Manila Mayor Alfredo Lim. 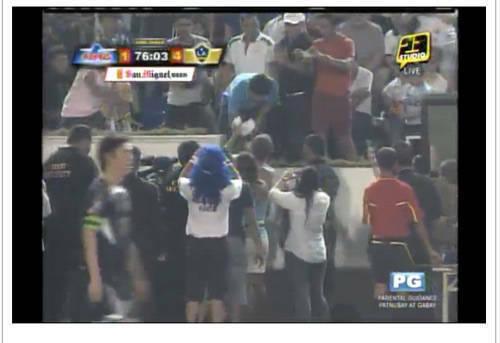 After playing for 75 minutes, Beckham took off his jersey and gave it to Pacquiao. The boxing champ’s wife Jinkee was later seen giggling while holding the jersey. Beckham also offered a second jersey to Younghusband at a post-game press conference. Click on the photo to watch Beckham hand over his jersery to the boxing champ. The football star drops by UNICEF Philippines.